Today mum put me down on my hands and knees. Usually I cry when she does this but today I decided it might actually be good fun. Maybe I'll soon see if I can move. 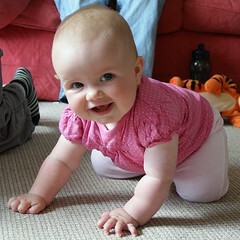 Charlotte showed me how by crawling round and round me calling my name, then Léon got on her back. He said he was playing horsey. I got a bit worried when he came towards me saying Anna's playing horsey too now.